If you are a WordPress admin and new to it as well then you might have noticed that every time someone comments at your site you will get an email notification asking you to review the comment. It is helpful however, it does becoming annoying sometimes specially if you are bombered by SPAM. WordPress has this option and you will not need to install any plugins to get this done. Navigate to your Adminstration Panel. Click on Settings and then on Discussion. 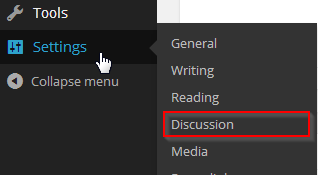 At the Discussion page, you should have the Email me whenever option where you should have the notication options. Uncheck Anyone posts a comment / A comment is held of moderation and you will not receive any notification. Please be sure to moderate all comments to avoid SPAM.